SITE123 – is an easy-to use website builder that makes it possible to create promo sites, landing pages, blogs and small online shops. All websites created on the basis of this platform are responsive and can be browsed on any mobile devices. The website builder features exceptional ease of use, which is manifested in its convenient website editor, abundance of tips and design customization tools that are intuitive and simple for everyone. One of the major SITE123 features is an opportunity to create multilingual websites. Just choose a plan, buy it, let’s say, for a year and start creating sites, each of which can eventually bring profit and attract clients from the country you need (the number of website localizations depends on the plan you choose). The service is mainly oriented on users and business owners, who need a website quickly, easily and without settling for less when it comes to quality and professionalism. The fact is that SITE123 is so simple and easy-to-use that even newbies willing to develop custom-built websites can use it. No coding, web design skills or experience of working with databases and hosting settings are required to do that. The system has a user-friendly and understandable multilingual (available in more than 15 languages) interface. So, let’s test it now to make the unbiased conclusions. No coding and web design experience needed. SITE123 is very easy, irrespective of web design background and skills you have. There is no need to master programming languages to get involved into the web design process – the interface of the service is intuitive and provides lots of tips to guide you through the web creation process with ease. You can register with SITE123 and start creating a website through your Google or Facebook account. The dashboard is very simple, intuitive and understandable even to a newbie. It contains only useful options and features that affect the quality of websites you will create. You won’t find anything complicated or useless here. You don’t have to be a pro to manage with SITE123 Dashboard. It is so simple that even a newbie can learn it in less than 10 minutes. Building websites with SITE123 is as easy as ABC – the name of the service speaks for itself. Basically, you can create a decent website in three simple steps: select a template, fill it with content and publish! Can there be anything simpler than that? Definitely, no. As you go through the design customization process, you will see the result in the preview mode for different types of devices, including desktop computers, tablets and mobile phones. That’s also very convenient for non-techies, who appreciate an opportunity to control the process of website development in the real-time mode to be able to fix the problems on time. Quick sign up and website design procedure. SITE123 makes it possible to access the Dashboard itself. This is the place, where you can see all the websites you have created. You can edit, copy and delete them, add new ones, set up domains, check your balance etc. You can also look through the list of incoming messages, orders, comments and newsletters for each website. SITE123 comes with a visual editor without the ‘drag and drop‘ feature: all changes at the website are made through the sidebar settings and are seen in the real-time mode. For those, who are going to use SITE123 to launch functional, logically-structured and visually-appealing online stores, the system offers an advanced eCommerce tool that allows creating an impressive marketplace for effective customer generation in a simple and hassle-free way. With SITE123, you’ll be able to manage the orders and products to boost your online sales and provide customers with flexibility of choice. It is also possible to adjust your web store design based on the niche you specialize in. This concerns all the elements of your online store, starting with show window design and up to the shopping cart look. SITE123 also provides multiple currency choice options, offering a broad range of local and international currency types, the list of which is being updated on a regular basis. What’s more, the website builder now comes with PayPal, Stripe and 2Checkout payment methods, which makes it possible to accept payments online. If a user cannot make online payments for some reason, the system allows making use of the offline bank transfer option. 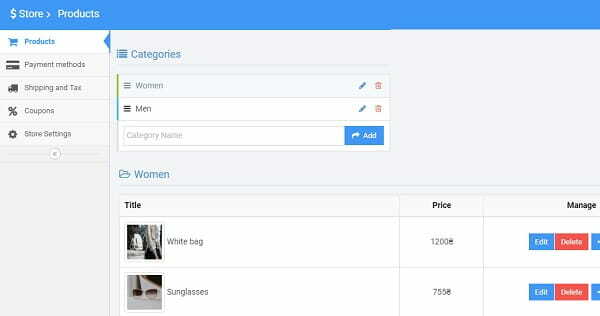 Another highlight of the SITE123 eCommerce toolset is the ability to create and manage coupons to offer discounts to users shopping in your web store. Most customers appreciate this option and, thus, will be more likely to come back again. Apart from that, the website builder lets you set product characteristics (color, dimensions, material, price, discounts etc.) and subdivide the goods into categories based on these parameters. This contributes to better perception of products by customers, encouraging them to buy from you in a simple and convenient way. You can also benefit from making use of this option as you won’t have to duplicate products available at the website. Furthermore, you will be able to add as many product photos as needed, thus, allowing the potential customers to view the goods from different angles, exploring their special characteristics. Among the other advantages of the SITE123 eCommerce tool, it makes sense to mention multiple gateway integration, tax and shipping settings, an option allowing to sell digital products along with physical ones, shopping cart display in the web store menu, store inventory system set up, display of related products that may be a nice alternative to the items customers look for and more. These features make SITE123 a decent choice for users, willing to establish reliable web store presence. Launching a blog is an effective way to give your website better online exposure and attract the attention of users interested in your niche. This is a helpful tool to post versatile content, including articles, your own posts, photos, videos, audio files etc. Topics may differ with regard to your blog specialization and the goals you pursue. Creating a blog with SITE123 doesn’t take much time and effort as the system provides you with all the required tools and options needed for this purpose. 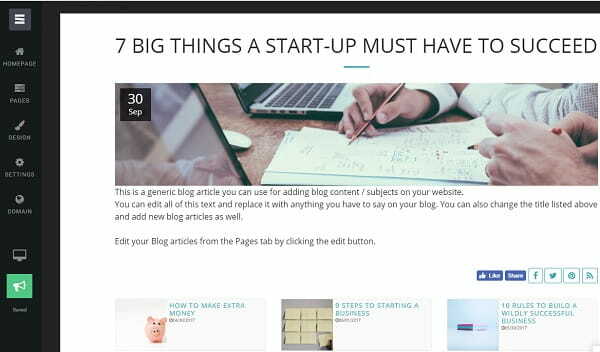 You can choose between a variety of high quality blog templates based on the style, theme and features you need. Having written a new post, you don’t have to add it immediately to your blog. Scheduling option allows you to set the date and time, when you would like your posts to be published. Thus, you can go on a vacation or plan your everyday life as you need, for example, and the system will automatically update your blog with new scheduled posts. SITE123 also has a nice blog commenting system, which allows users to leave their comments under each post, share their ideas and initiate discussions on the topics tackled. The feature is a nice tool to grow your website traffic and keep your blog interesting and live. If you don’t wish to approve each blog comment, you can set up the auto confirm feature, which will automatically accept all the blog comments without any preliminary moderation, thus, saving your time and effort. At the same time, the system makes it possible for you to reply to each comment individually. If you wish, you can use the Disqus or Facebook comment systems, when managing your blog comments. If you wish to allow users to follow your blog updates on time, SITE123 makes it possible to generate the RSS feed readers can use to track the blog updates. The option is easily enabled in the settings section. Making sure a site is protected from unauthorized access is a must for any website owner. Realizing this necessity, SITE123 allows connecting the secure SSL encryption protocol to your project, thus, making you feel sure about its safety. SSL-certified websites have a higher degree of confidentiality, while the data they contain are protected by the advanced security settings 24/7. SITE123 offers this option for free. Having an email that will look like email@yoursite.com will contribute to your website promotion and traffic growth. This gives any website professional look, not to mention the increase of your business reputation and growth of customer trust. With SITE123, you can create and activate your domain-related email at no cost at all! 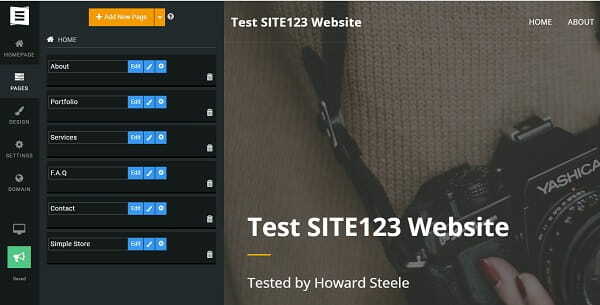 Recently SITE123 has launched very useful tool for international businesses. 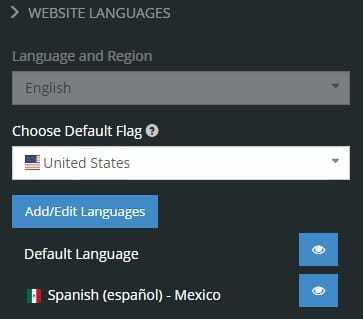 Now you don’t need to create a separate website in other languages, you can simply add another language version to your website. But this simplicity has a set of features I have never seen in any website builder before. The system automatically translates all headers and subheaders of your site. Using Language manager you can edit the default website translation in a dialog splitted window, where in the left side there is your original content and on the right side – the content from another language version. What’s more – the number of language versions could be up to 5 (depending on your pricing plan). You can also connect a separate domain name to each language version in one click – the dream of mane webmasters who work with multilingual websites. SITE123 websites are optimized for the search engines by default. The system currently offers core SEO tools to contribute to your website ranking. What you can do here is fill out the title and description for all pages, edit meta tags, customize URLs, assign alt tags to images. This will improve the positions of your website in the search engine results in the long run. Don’t worry, if you have never done that before. The system will guide you through the entire SEO optimization process, providing helpful tips and prompts on any stage. As of today, SITE123 doesn’t have an integrated statistics tool. However, if you wish to keep track of your website data, you are welcome to connect Google Analytics any time you consider it necessary. The website builder lets you link to around 25 popular social media platforms. The service you’d like to add to your website will be displayed as an icon in the footer. This means that you can’t embed any live social media feeds. Among the platforms you can connect to your website, it makes sense to mention Facebook, Twitter, YouTube, Instagram, LinkedIn, Pinterest, Vimeo, SoundCloud, TripAdvisor, Tumblr, Flickr, Behance, GitHub and more. As far as the website builder is mainly oriented on non-techies, having an opportunity to create a backup version of the project is a must. SITE123 offers a convenient autosave feature to prevent potential bugs and mistakes. You won’t have to worry about the safety of your website content now. The website builder has its own App Market. This is where you may come across multiple applications, which are known as “plugins” here and are available in the settings menu. The number of plugins is not quite impressive, but you can access and integrate the most widespread and popular apps here, namely Google Ads, Google Analytics, social media tools and more. SITE123 offers an opportunity to host your ready-made website for free. Just sign up for an account, select the plan that suits you most and enjoy the features it offers (free hosting included). All in all SITE123 is an ideal choice to develop business websites and blogs. You can also create a small or mid-sized online store, but get ready to add all the products manually. Other settings like discounts, payment options, customizing delivery and additional fields are also missing. There is a shopping cart and an opportunity to accept PayPal and Stripe online payments. Creation of website backup version. Right after the registration procedure, you will be offered to choose one of the categories for a future website (restaurants and food, business, photography, art, CV and portfolio, marketing, medicine, technologies, sport, fashion and beauty, online-shop etc.). Each category involves from 5 up to 10 themes. As of today, the website builder encompasses 16 niche themes to come up to the prevailing amount of users’ needs. The quality of templates is high, although, their versatility is a bit doubtful. Fortunately, customization tools at SITE123 are flexible and easy-to-use. You can apply any of 13 tools for each template. In this case, the positioning of blocks will notably change. Color styles are also adjustable at the platform. You can choose any color scheme offered or adjust it manually. It is also possible to change menu button styles, fonts and enable/disable social media buttons. Changing templates on the go is not allowed here, because each theme comes with niche-specific demo-content. If the template you have selected has not come up to your needs for any reason, just create a new website using another theme. Another good thing I want to take a point is a free image and icons library. Such tool is especially will be on a great purpose to novices who need to customize a website without browsing the Web searching for the icon or background image he or she needs. To sum up, SITE123 offers similar, but high quality templates. The only thing that differs them is the images in the demo-content. You can change the structure and design of the home page, enable parallax effect and transparency, upload your own images and change fonts and color schemes. The website builder also offers an opportunity to create a site in two variants, namely one-page and multi-page. Correspondingly, you will get either a landing page or an ordinary website with the same content. Anyway, this website will be responsive to fit any display sizes. SITE123 comes with a nice mobile editor that lets you create and customize websites optimized for mobile viewing. You can see the result of the web design process as well as the way the project is displayed on desktop, tablet and smartphone screens in the preview window. The fact that the system lacks customization features contributes to more precise and effective mobile optimization of each and every website element and process. Absence of the standard drag-and-drop feature leaves the code unchanged and clear, which allows the website builder optimize versatile variations to ensure its flawless look on mobile devices. Versatility of templates and niche categories. Despite its simplicity and intuitive nature, the website builder still offers quality customer support assistance. As of today, the support center of the service encompasses 18 categories related to the most widespread issues and product features. Whatever problem you face, just browse the categories to find the one that corresponds to your issue most of all. Each category comes with useful tips, articles, guidelines and tutorials aimed at helping you solve the problem in the shortest time possible. A convenient search filter option will help cut down the search time, providing great result. In case you haven’t managed to find the answer to your question, you may contact the system agent via the live chat. It is available 24/7 and reacts to user inquiries within a couple of minutes. So, you won’t have to stop working and wait for the answer to solve your problem. Abundance of tutorials and guidelines. ✓ Sell up to 50 products/mo. ✓ 500 products for sale/mo. ✓ Unlimited products for sale. The system offers five plans, which differ in the volume of disk storage space and bandwidth of the website. The pricing policy of SITE123 differs depending on the user’s region. Here we’d looked though the pricing for North America users. Free plan is not worth the attention because of the inability to set up your own domain and the ad banner of the website builder visible at the site. It may be used to explore the options the platform offers. Keep in mind that any plan makes it possible to create the unlimited number of websites on one account, yet each website must be paid separately. The problem is the volume of the disk storage space and bandwidth. The bigger website you wish to create, the more expensive plan you will have to buy. Product order limits (except Gold Plan), in their turn, make it impossible to create a network of small online shops. However, nothing prevents you from creating business sites and blogs here. All in all, SITE123 is quite affordable, you can create here as many online stores and business websites as you need. The flexible tariff policy to users from different regions makes this website builder more affordable comparing to other cloud services. An opportunity to create even one website for $129.6 per year seems quite a nice investment. Thus, this website builder is a good option for those users, who are going to work with client projects. Free plan to test the system. Four paid plans to come up to various user needs. SITE123 is a nice website builder for newbies. Just like any other system, however, it has a number of merits and demerits associated with its feature set and functionality. Awareness of these nuances may help you decide on further application of the service. Let’s enlist the major pros and cons of the website builder right away. ✔ Simplicity, ease of use, no coding and web design skills required. ✔ A rich choice of templates and nice customization tools;. ✔ Powerful customer support center. ✘ Inappropriate range of settings for professional users. ✘ Too simple online shops and landing pages (but they are good enough for the most users). To sum up, the platform is a great choice for newbies willing to create one or two websites for personal use, such as business sites, portfolios, blogs or online stores. Versatility of designs and template categories. SITE123 is a nice website builder for most users. It can be used to create business websites and online stores. There is also an opportunity to build blogs and landing pages, their quality will surely meet the needs of professionals. 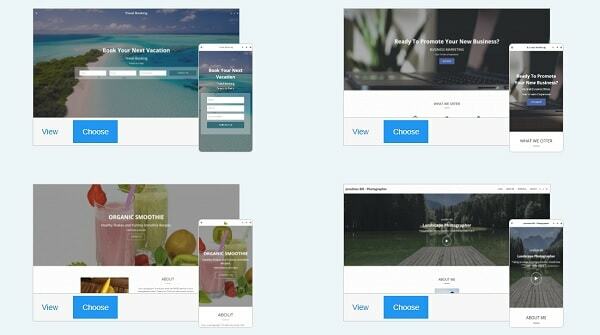 Setting up plugins can notably expand the functionality of the system, and this makes the website builder a versatile tool for creating different types of projects. SITE123 is a cost-effective platform for those users, who wish to create one site. Websites created with this builder are modern, stylish and appealing. The dashboard tools come up to the requirements and needs of clients. While testing the platform, I have concluded that the initial impression on SITE123 corresponds to its real features. The website builder is great both for personal use by newbies and professional web designers. It looks reliable and nice, and its functionality is quite enough to work with clients’ websites. Get started today, it’s free!